Webster’s Seventh New Collegiate Dictionary defines wild (adj.) 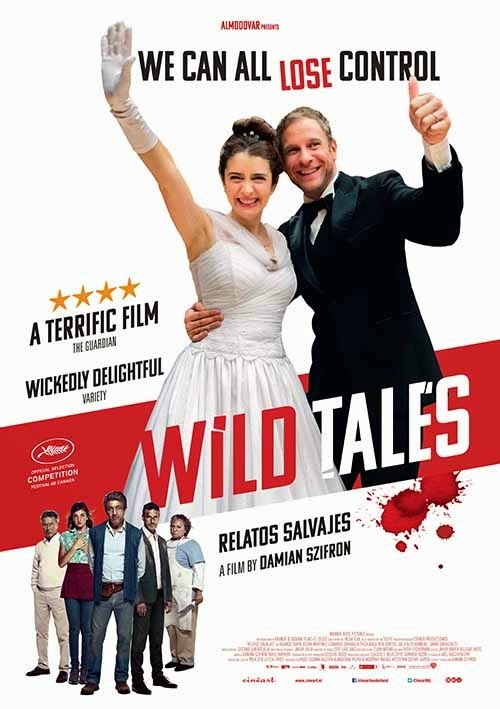 as “uncivilized,” “barbaric,” “indicative of strong passion, desire or emotion,” “escaped from normal restraints of control” and “characteristic of, or appropriate to, or expressive of wilderness, wildlife or a simple or uncivilized society.” Damien Szifron’s Oscar-nominated Argentinean omnibus film WILD TALES pretty much lives up to every one of those descriptions. Co-produced by Pedro Almodovar, it shares many of the strengths (an uncanny ability to orchestrate pitch-black comedy for starters) of that Spanish auteur’s best movies. The omnibus or anthology film has a spotty track record throughout film history. Invariably some chapters—at heart, they’re the cinematic equivalent of short story collections—are stronger than others, which only makes the weaker episodes seem that much worse by comparison. Probably because the form seems ideally suited for suspense, horror anthologies have been the most commonplace variant dating back to 1945’s diabolically clever DEAD OF NIGHT. Yet for every TALES FROM THE CRYPT (Freddie Francis’ 1972 anthology based on old E.C. comics) or TWO EVIL EYES (Dario Argento and George A. Romero adapt Edgar Allan Poe), there have been scads of tony arthouse samplers, too. BOCCACIO '70 (directed by Federico Fellini, Luchino Visconti and Vittorio De Sica respectively) and YESTERDAY, TODAY, AND TOMORROW (all DeSica) wowed them in the 1960’s. More recently, EROS (Michelangelo Antonioni, Steven Soderbergh and Wong Kar-wai tackled amour in its various permutations) and PARIS JE T'AIME (utilizing 18 different directors, it was kind of the speed-dating equivalent to the omnibus template) tried resuscitating the genre with decidedly mixed results. What helps distinguish the extravagantly enjoyable WILD TALES from virtually every previous anthology movie, though, is its remarkable consistency. There really isn’t a stinker in the bunch. (Szifron wrote and directed all six episodes which might explain how he manages to maintain such enviable quality control.) The opener—more of an amuse-bouche—is set aboard an airplane whose motley crew of passengers soon realize they’re in the hands of the same man they all wronged at one time or another. One guess what he has in store for them. Having expeditiously established both tone (mordantly funny) and theme (revenge is a dish best served, well, at any temperature), Szifron merrily devises ever more diabolical variations in his remaining tales. “Road to Hell” (road rage writ cartoonishly oversized) revises Steven Spielberg’s DUEL for the MAD MAX era; “The Rats” (a diner waitress enacts vengeance on the obnoxious customer who destroyed her family years earlier); and “The Deal” (class-consciousness takes a homicidal turn after a hit-and-run accident) are all world-class divertissements. But “’Til Death Do Us Part” and “Bombita” are the stories you’ll likely be talking and arguing about once you hit the parking lot. In the latter, Ricardo Darin (Argentina’s answer to George Clooney) plays a demolitions expert who uses his very specific skill set to get back at mindless government bureaucracy. Darin’s Simon is a latter day Howard Beale: mad as hell and determined not to take it anymore. The ebulliently horrific (and deliriously romantic) “’Til Death” could be my favorite “Wild” tale, though. Set against the backdrop of a lavish wedding reception, it details the lengths to which a bride will go upon discovering that her new husband has been cheating with a coworker. As site-specific as WILD TALES is to Argentinean culture/society, it’s amazing just how universal and accessible it is. A North American remake would most likely be as popular here as Szifron’s film was back home. After all, everyone loves a good “worm turns” scenario, whatever their country of origin. 4 out of 4 stars.